The slipped stitch cardigan has taken on a new name – the Monday Morning Cardigan! Throw on this cardigan and be ready to face your week! Classic style and feminine shaping make Monday Morning a great sweater for work, play, or whatever comes your way. Knit seamlessly from the bottom up, with a beautiful slipped stitch pattern that lies flat and doesn’t contract like ribbing. Three-quarter sleeves stay out of your way, and visually interesting waist shaping enhances your curves! Top by Grace & Cello, skirt by Passenger Pigeon (sadly no longer in business). The length of the body and sleeve from the underarm down is the same for all sizes. 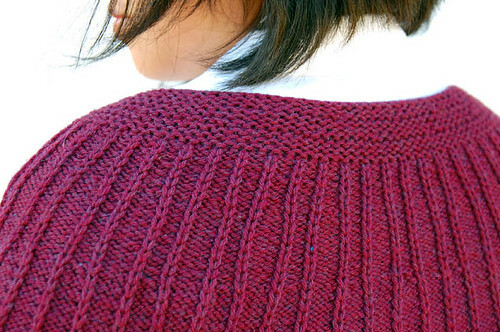 Notes are given throughout the pattern to modify the sweater to fit you! 6-page PDF includes photos, schematic and abbreviations. Payment by Paypal (balance or credit card; no account needed) and downloads by Ravelry (no account needed). That’s beautiful, Laura! Can you please tell me what the upper arm circumferences are for the two largest sizes? I have bigger upper arms than most people with my chest circumference. Beautiful! Very flattering, and it looks so comfy! Love it! Into my queue it goes! Hi Laura ! 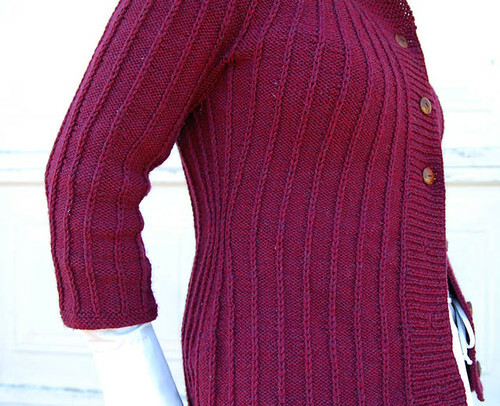 Another beautiful cardigan. It’s amazing how creative you are. I have already bought the pattern. This cardigan will be perfect for next autumn !!! Love, love love this! I am using this same color yarn right now to make a sweater coat and now I wish I had more to make this. Might have to order more. Thank you for this lovely pattern. Love it! Totally getting this one soon! I was just thinking this morning that I wanted a cardigan. I am buying it now. Thank you for such a beautiful creation!!! Gorgeous sweater! I may have to change from hoodie Mondays to cardi Mondays. gorgeous!! do you think it would work with cotton? Unbelieveable. 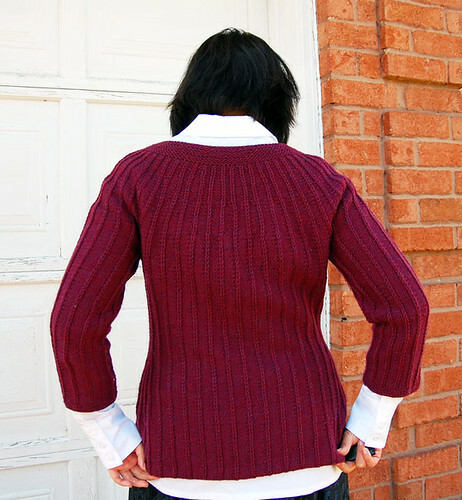 Just a couple of weeks ago I was working something small and utilitarian in this pattern and thought – this would be great in a sweater and now HERE IT IS! congrats on another beautiful pattern! i love everything about this sweater. Oooh, I love the waist shaping! Great sweater. Definitely going to order that one! Very cool! I love the interest in the waist shaping. You are modeling the 38″ bust, correct? Love love love … bought! Oh, awesome! I’ve been waiting impatiently for this one. And I love that you’ve got a “buy now” button–it’s a huge improvement over calling on the phone and having a hard copy mailed from Canada! I LOVE it. Now to choose which colour of cascade to knit it in! i’m gone a do this, yes mam ! Really love this sweater. Great for work. Can’t wait to make it in Laurel. I think the slip stitches will really pop! Hi Laura! Had to comment on your latest pattern design. I love this stitch pattern. I’ve noticed it out there quite a bit this season. And you made it in my favorite color so I’m really anxious to make one for myself. Very classic. Thanks for taking the time to write it up. would like to have it immediately !! yet haven’t seen one that I didn’t like. I once was when I was working. Happy Knittin & Stitchin !